This book picks up right where War on the Mafia left off. Mack has a million dollar bounty on his head and every mobster in America wants to collect it. Bolan realizes that he may need some help. He recruits ten of his old ‘Nam buddies, all ruthless killers in their own right, and assembles a crack assassination squad. It would have been better if Pendleton had only shown Mack bringing in two or three old war buddies. With so many characters, it’s not possible to flesh them out in such a short novel. Half of them are pure stereotypes like the hippie, the Indian, etc. All of them easily agree to work for Mack, risking their lives and their freedom, merely for the thrill of killing and whatever spoils they can collect along the way. A little more conflict among the gang would have helped flesh out this straightforward story. 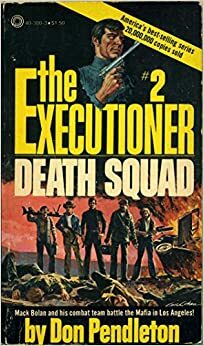 Because this is a team book it differs from the other Executioner novels. Mack is merely one of many characters which includes not only the Death Squad but also a cast of mobsters, hitmen, and cops. There is one glaringly absent character type… women. As in, not a single one. Mack doesn’t get laid even once, he’s just too busy killing. And kill he does. Now with a team he can wipe out entire Mafia families in one fell swoop. It is only when Mack finally underestimates multiple families ability to work together that things start to fall apart. Ten trained and heavily armed assassins can cause a whole lot of damage but there are only so many armed men they can kill at one time. Needless to say, after this experience, Mack decides that it’s best to work alone.